Many factors may contribute to a foggy window. For starters, it’s essential to first understand where the fog is occurring: on the outside or exterior of the window, on the inside or roomside surfaces, or in between the panes of glass. Exterior condensation on windows occurs when the temperature inside the home falls well below that outside, like on a hot humid day. When dramatic differences in interior and exterior temperatures and humidity levels occur, moisture condensation can build up on the coldest surface—the glass. It’s the same phenomenon that causes a cold glass of your favorite beverage to sweat on a sizzling summer day. Likewise, when interior humidity is high, as temperatures drop outdoors, condensation can occur on interior glass surfaces. To protect your investment in your home and home furnishings, reduce interior moisture to help alleviate interior glass condensation. Moisture and condensation between panes of insulating glass can occur when the seal between the panes of glass fails. This typically occurs in older windows or doors where the seal has failed and allows moisture to leak in. It’s not uncommon to walk into older homes and see windows on the sunny side of the home with a glass seal failure that allows condensation and fogging between the panes. 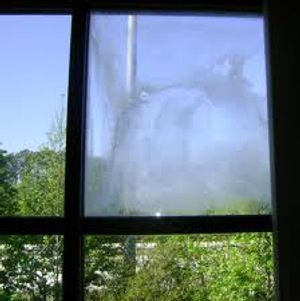 This same fogging can occur on any side of the home, but tends to be more prevalent on the sunny sides because the additional heat from the sun tends to accelerate the seal failure. Also, with the sun shining through the glass, the fogging can be more visible and readily apparent. Virginia Glass House & Mirrors Insulated Glass Units are professionally made using High Quality Desicant within the aluminum spacer bar to rapidly absorb any moisture that may get between the 2 pieces of glass. Each unit is sealed with hot melt butyl to ensure that moisture does not enter the sealed unit. We offer a limited warranty of 5 years for each unit Virginia Glass House & Mirror manufactures. 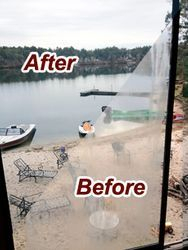 In most cases we can repair your broken / fogged window the same day! Our Insulated Glass Units can be made using any pattern glass, safety glass, or any color glass that is offered. Laminated Glass can also be used to manufacture Insulated Glass Units to reduce noise from a busy road or surrounding business. Virginia Glass House & Mirror also offers Low E glass and Solex Glass to increase efficiency within your home or business and eliminate UV rays to protect your furniture, carpet, or other precious belongings. In addition, we can manufacture Insulated Glass Units using a poly-carbonate glass to eliminate breakage and/or gun fire to your windows for increased safety of your family or business.